The intestinal microbiome is known to play a fundamental role for the health of the host particularly in respect of its metabolic capacity, which is reported to be comparable to that of the liver. For this and other reasons such as dietary effects, the intestinal microbiome is receiving increasing attention in the field of toxicology. There are significant interindividual and interspecies differences in the composition of the microbiome, however, it is not known to which extent this affects chemical metabolism of the eukaryotic host, particularly in the intestinal tract. It is hypothesized that these differences contribute to species-specific effects and individual susceptibility to chemical toxicity. In addition, common practices in toxicological studies, such as the use of a vehicle (e.g. corn oil), housing and bedding and diet are reported to affect the microbiome and therefore potentially also have an effect on chemical metabolism. If the chemical under test is metabolized in by the microbiome changes in the microbiome, be it in composition or metabolism, could impact the toxicological effect of exposure to that chemical. To account for the role of the microbiome in toxicity studies, and to pave the way for future in vitro based risk assessments based on in vitro – in vivo extrapolations (IVIVE), a systematic understanding of the metabolic capacity of the intestinal microbiome is essential so this can be built into these systems. Microbiota tends to be species specific. With regard to xenobiotic metabolism it is thus important not only to understand the potential microbial contribution to substance toxification and exposure but also to which extent these results are transferable between the current toxicological gold standard rat and humans. Therefore, experimental data from animal studies are needed to increase our understanding of the fundamental role of the intestinal microbiome for toxicology, and in vitro models need to become available for future human-relevant in vitro based risk assessment strategies to study interspecies and interindividual differences that are needed for IVIVE. Develop a systematic understanding of the metabolic reactions and capacity of the intestinal microbiome and interindividual variation in humans and common laboratory rat strains. The project should consists of studies which will elucidate that contribution of gut microbiome metabolism in rats and provide a base set of information to which further in vitro investigations can be compared. This objective should form the basis for the overall evaluation of the importance / contribution of the gut microbiome to in vivo metabolism. Develop a relevant experimental in vitro model to study intestinal microbial metabolism of chemicals. Use this model to elucidate interspecies and interindividual differences in the intestinal microbial metabolism of chemicals and humans for named selected chemicals of toxicological relevance. Compare this metabolism to that in common laboratory rat strains. Develop an approach to show how intestinal microbiome metabolic capacity can be integrated in an in vitro in vivo extrapolation approach. Gather and combine existing knowledge about the intestinal microbial metabolism of chemicals in rats and humans, and define knowledge gaps. Produce a state of the art review, or workshop, within 6 months (costs ca. 25,000 €). To assess the consequences of changes in the microbiome on its functionality for the host, a metabolomic approach to both matrixes - microbiome metabolites (i.e in the feces or intestinal tract content) and their metabolites in the host (e.g. blood) - should be performed. The core part of the proposed research should consist of several treatments to induce microbiome changes in rats and assess the effects thereof, as well as potential intestinal microbial metabolism of chemicals used. It is necessary that in this part of the research also quantitative aspects of gut microbiome related metabolism and its consequences for the host are addressed. Assuming ca. 10 treatments and a duration of ca. 2 years, expected experimental costs and cost for a PhD/Post doc student are estimated to be in the range of € 300,000. The results of this work should provide an insight of the overall importance / contribution of gut microbiome metabolic capacity for its host and will form the basis of further comparisons with in vitro research as defined below. 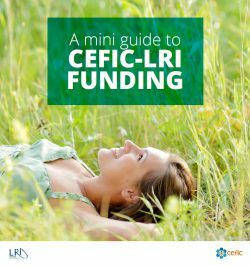 Download here the full version of the RfP LRI-C7.